This is not new. Other researcher have found a similar relationship. The Gallup organisation has also reported data indicating the relationship between religiosity and factors related to the emotional quality of life (see Religion Provides Emotional Boost to World’s Poor). It appears that the non-religious in countries with a low average annual income were more likely to experience negative emotions than the religious. (These tend to be countries with higher religiosity). However, for countries with higher income average annual income religiosity did not seem to influence happiness. Confirmation bias tempts people to interpret statistics in a way favourable to existing prejudices. For example, the first figure will temp atheists to claim that Christianity is associated with poor writing proficiency. And the religious may claim, on the basis of the Gallup statistics, that religiosity is correlated with individual happiness. Unfortunately, motivated people will quote such statistics without looking any deeper than the superficial numbers. Proper interpretation of the first figure requires consideration of sampling bias, both in the general sample (registrants at a dating site) and in the self selection for the different religious classifications. The Gallup organisation has provided more data allowing a more sensible interpretation of their statistics. Clearly one should not use this data to claim that religion makes people happier generally. A deeper look shows conclusions should be different for higher income countries than lower income ones. My take on the Gallup data is that religion plays a more functional role in poorer countries. It is more important to the individual in terms of social support and contact and the everyday organisation of life. On the other hand the non-religious person in such an environment may feel less social support, involvement and acceptance. Not conducive to happiness. 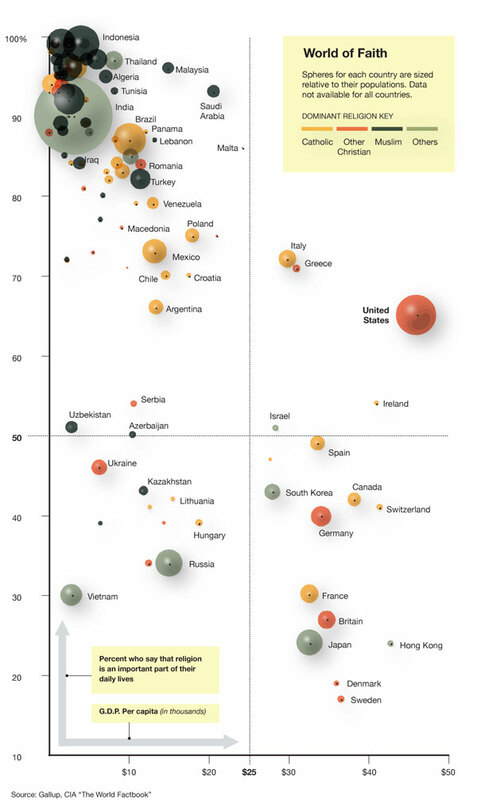 In contrast religion has a less important role in more developed, more secular countries. Governments and non-religious organisations are more likely to provide social support (welfare). There are far more avenues open for social involvement in secular societies. Consequently the non-religious are less likely to suffer from social exclusions or opportunities for social involvement. This entry was posted in belief, religion, SciBlogs, science, Science and Society, superstition, tradition and tagged atheism, Christianity, Psychology and Religion, religion, Religion and Spirituality, SciBlogs, Social Sciences, statistics. Bookmark the permalink. What do Australia, Canada, Ireland, the Netherlands, France, and Switzerland have in common? That’s right, out of the 10 countries with the highest standard of livings, the majority of them are plurality (and in some cases majority) Catholic. Also if you want to REALLY “dig deeper” check Dinesh D’Souza or Jonathan Hill. Oh yes, let’s check him out. Let’s see what a dishonest, lying quote-mining toad he is. Then of course there’s “The Enemy at Home” with The Colbert Report. want to write something coherent about statistics or the effect of religion on society? @Ropata Interesting to compare your first 2 sets of data. Aside from Brazil none of the top GDP countries appear to be especially happy. Ex-spanish or portugese colonies seem to feature significantly in the happiest nations, hence the high rate of catholocism. It raises some interesting questions about what it is that makes folk happy. Some of these countries aren’t especially wealthy, so maybe the simple life is more conducive to enjoyment than our fast-paced consumer-driven western lifestyles. I’ve recently started a website, the information you offer on this site has helped me greatly. Thank you for all of your time & work. “One of the greatest pains to human nature is the pain of a new idea.” by Walter Bagehot.